Since 2013, a number of vehicle manufacturers have initiated recalls to replace frontal airbags manufactured by Takata due to a risk of incorrect deployment that can result in the release of metal shrapnel from the airbag inflator unit. Due to the number of affected vehicles, the supply of replacement parts has been delayed in a number of cases, resulting in lengthy delays before recalls can be completed. The NZ Transport Agency has been made aware of a practice in Japan where front passenger airbags have been disconnected as an interim measure pending the availability of parts needed to carry out the recall on the vehicle. The disconnection process involves fitting an electronic component to simulate the presence of the airbag so that the warning light operates as normal. A number of vehicles with disconnected airbags have already been imported into New Zealand and registered in this condition. Land Transport Rule: Frontal Impact 2001 requires that frontal airbags and airbag warning lights must not be rendered inoperable. As such, vehicles that have had their airbags disconnected do not comply with applicable requirements and cannot be issued a WoF. Where vehicles with disconnected airbags can be positively identified without dismantling the vehicle interior, this information must be taken into account in carrying out the WoF inspection. At this stage, the Transport Agency has airbag disconnection information for Toyota and Mazda vehicles only, but in some cases other vehicle makes and models will be fitted with identifiers indicating that the airbag has been disconnected. This bulletin will be updated as the Transport Agency receives more information about the situation. For all used Toyota and Mazda vehicles imported from Japan and first registered in New Zealand from 1/1/2015, the registration plate must be checked at www.rightcar.govt.nz/recalls. If the vehicle is identified as having a disconnected passenger airbag, the vehicle should not be issued a WoF until evidence is provided that it has been reconnected. This evidence must take the form of a letter or invoice from a motor vehicle dealer, or from a Transport Agency-appointed vehicle inspector (such a repair certifier, entry certifier or WoF inspector), confirming that the airbag recall has been completed for the vehicle or that the airbag has been reconnected. 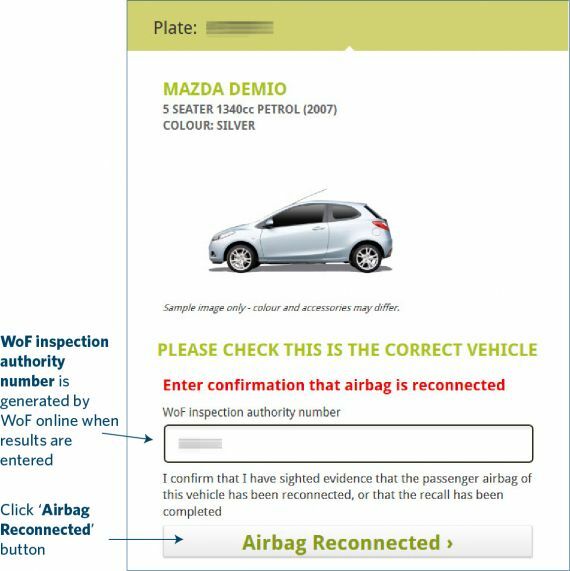 Once evidence has been provided that the airbag has been reconnected, the WoF inspector must enter a notification to this effect at http://rightcar.govt.nz/recalls/wof using the notification process outlined below. 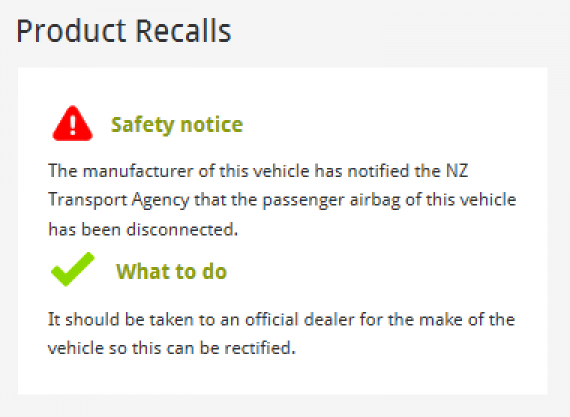 The check of www.rightcar.govt.nz/recalls may be carried out by the WoF inspector or another staff member, such as a customer service representative. 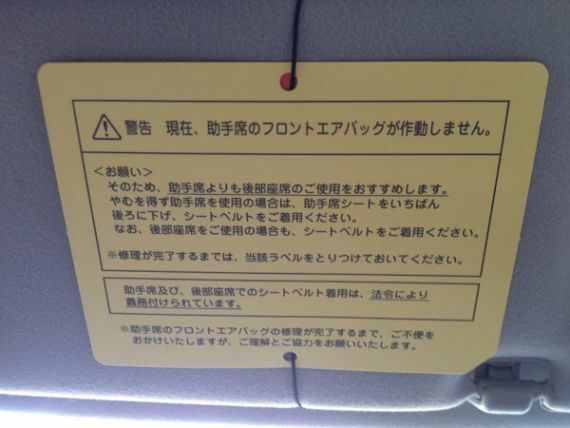 For all used vehicles imported from Japan and first registered in New Zealand from 1/1/2014 (other than Toyota and Mazda vehicles first registered from 1/1/2015), the vehicle interior must be checked for Japanese stickers or placards fitted to the passenger sunvisor that exactly match one of the two examples provided below. These stickers or placards will, in all cases, be yellow in colour and will cover the original airbag advisory stickers normally found in this location. 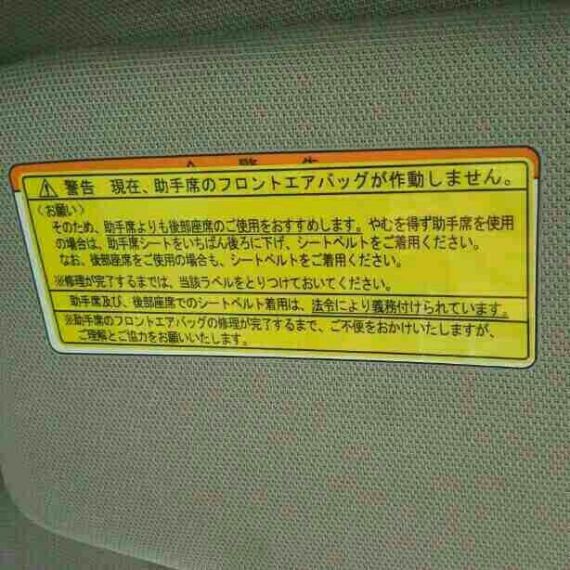 If any such stickers or placards are found, the vehicle must not be issued a WoF until evidence is provided that the passenger airbags has been reconnected. This evidence must take the form of a letter or invoice from a motor vehicle dealer, or from a Transport Agency-appointed vehicle inspector (such a repair certifier, entry certifier or WoF inspector), confirming that the airbag recall has been completed for the vehicle or that the airbag has been reconnected. The next screen that shows will have the vehicle details, including a sample image of the vehicle type. Check the vehicle details shown are correct. Click the Airbag reconnected button. The next screen that shows confirms that the reconnection notification is successful. You can then enter another vehicle if you wish. This technical bulletin will be updated as more information about the situation is received by the Transport Agency. Outlines how to identify vehicles affected by the recall and what to do. Mazda information is now also available. 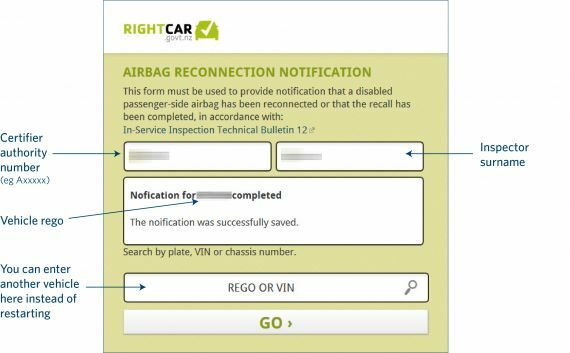 Replacement of email notification process with web-based notification process through http://rightcar.govt.nz/recalls/wof.